Our comprehensive toolkit for building secure mobile forms and applications will handle 100% of your mobile data collection needs. Today's mobile workforce demands technology that makes them more efficient in their daily tasks — but many are reluctant to use new solutions that fail them in so many ways. 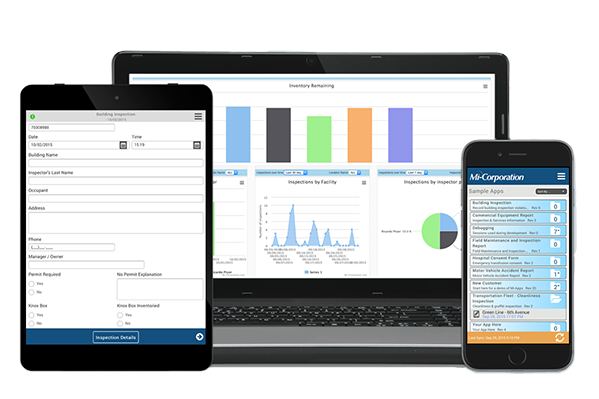 The Mobile Impact Platform is an intuitive, user-friendly mobile data capture platform that handles 100% of your mobile form needs, including routing and approval steps, integration, user management, offline syncing and data replication, and data security. It’s built on the same modern, scalable, and robust technology as Facebook's mobile app. Our web-based NextGen Designer has been crafted for the “citizen developer,” allowing both professional developers and those with limited technical skills to create robust mobile data capture applications quickly and easily. With the NextGen Designer automating your processes is easier than ever. The NextGen Designer provides unique features that improve the development experience, such as an intuitive three panel interface which allows the designer to quickly drag and drop a variety of field types onto a design palette, create sections, and preview and test the app within the design tool. Designers save time and lower frustration levels by designing once for deployment across all platforms! Make your forms smart by adding any business rule and data validations using our drag and drop interface. Fully customizable forms and apps – no scripting required. True cross-platform support (iOS, Android, Windows). Seamless integration with existing systems & data. Frictionless data replication for easy online/offline operation. Data immediately available in a variety of formats including CSV, XML and PDF. Learn more about our Next Generation Designer! Multiply field worker productivity by preloading relevant data in advance, then quickly capture text, photos, barcodes, GPS coordinates, voice, signatures and more. The Mobile Impact Platform runs on all modern mobile application devices from iOS to Android to Windows. Initiate workflows to automate notifications, sign-offs and package and send final reports. Collect Any Data - supports any data type you need — text, checkboxes, radio buttons, photos, GPS, barcodes, RFID, speech, handwriting and more. Initiate workflows to automate notifications, sign-offs and package and send final reports. Seamlessly integrate your mobile forms with your enterprise applications. Establish business rules for approvals and routing. Offering 90 proven API’s for connecting to major applications like SharePoint & SAP to critical databases like Oracle & Microsoft SQL Server.Take advantage of our Robust Offline Capabilities - not only will the Mobile Impact Platform enable your field workforce to collect data while offline, it also enables offline historical data look-up and form pre-fill so your employees can spend less time on redundant data and more time on data that matters. Data integrity – your team’s hard work is always saved regardless of your connection status and moved securely to the cloud when it’s available. Never a lost form or inspection. We help you eliminate data errors, data entry bottlenecks and reporting delays through real time reporting. 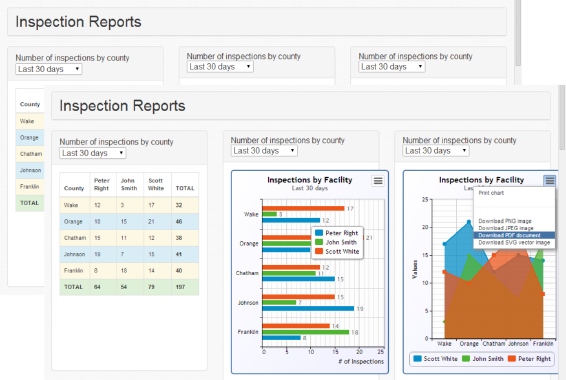 Discover more about your inspection results to correlate failures and root causes with Mi-Analytics. You can even analyze the time to complete forms, fields, sections and entire inspections - giving you unprecedented power to fine tune your field processes and digital forms for maximum throughput. Robust user management to control security, access to forms, authorization privileges and integration with Active Directory for user authentication. Cloud storage to provide unlimited space for your field collected data, photos and forms. Scale from 10 to 10,000 users with the manageability you demand. Data replication to ensure offline usage by mobile workers is as productive as sitting at a connected desktop. 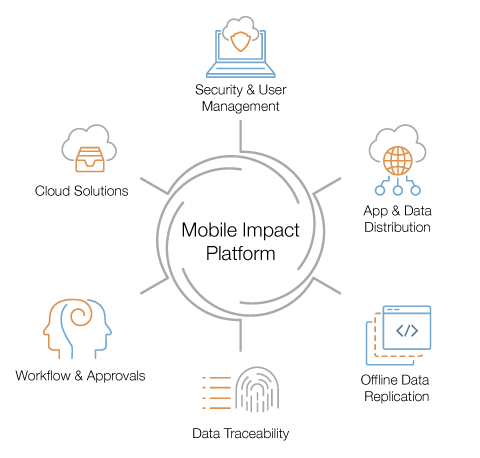 Security, like encryption on data at rest and in motion as well as application hardening that has passed some of the world’s toughest security requirements. Forms and data distribution via control groups, individuals and device types. Auditability and traceability with detailed audit trails. SQL database-driven and highly secure, the Mobile Impact Platform will complement your existing backend systems and contains over 90 APIs and web services for maximum integration capability.